QUEENIE took me on a ride, friends. At first, things were Bridget Jones’s Diary-ish and I was fine, giggling along because sure, Queenie was going through a difficult breakup but I had no doubt she’d emerge generally unscathed. You know worried, but not concerned, if that makes sense. But then Queenie’s decisions took a much darker turn, which spiked my concern to an eleven and made the world go quiet. I wasn’t prepared for the degree of vulnerability displayed on the page during those darker days, and it rendered me speechless. As in I couldn’t speak because I was crying too hard. 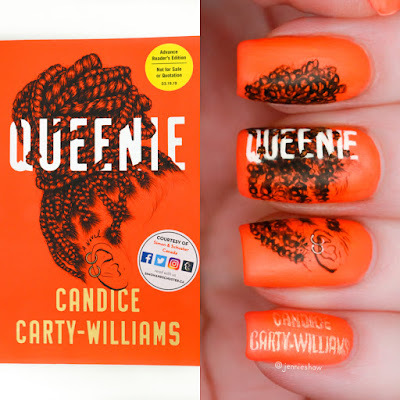 The POV kept me inside Queenie’s mind, which meant I viewed her experiences and rationalizations in real time. Wow, those rationalizations. Queenie didn’t value herself, and watching her accept/excuse terrible behaviour in exchange for companionship were the parts that made me weep. They hit close to home. *Tip. If you're also a white lady and think this scene was exaggerated or "people don't really talk like that anymore" please open your eyes. They do. And if it happens in front of you, SAY SOMETHING FFS. Use that white face of yours. Furthermore, if you don't think anything was wrong with the scene, or support the "overreactive response" take, you've got some major work to do and I hope you reflect on what your reasoning means, and how it's majorly problematic and must stop. In conclusion, OH MY HEART THIS BOOK. I honestly haven't stopped talking about it. By including Black Lives Matter, the fetishizing of black women, and feminism, along with the above-mentioned mental health and childhood trauma, QUEENIE proved to be a bold, fresh novel that broke my heart and then put it (mostly) back together. 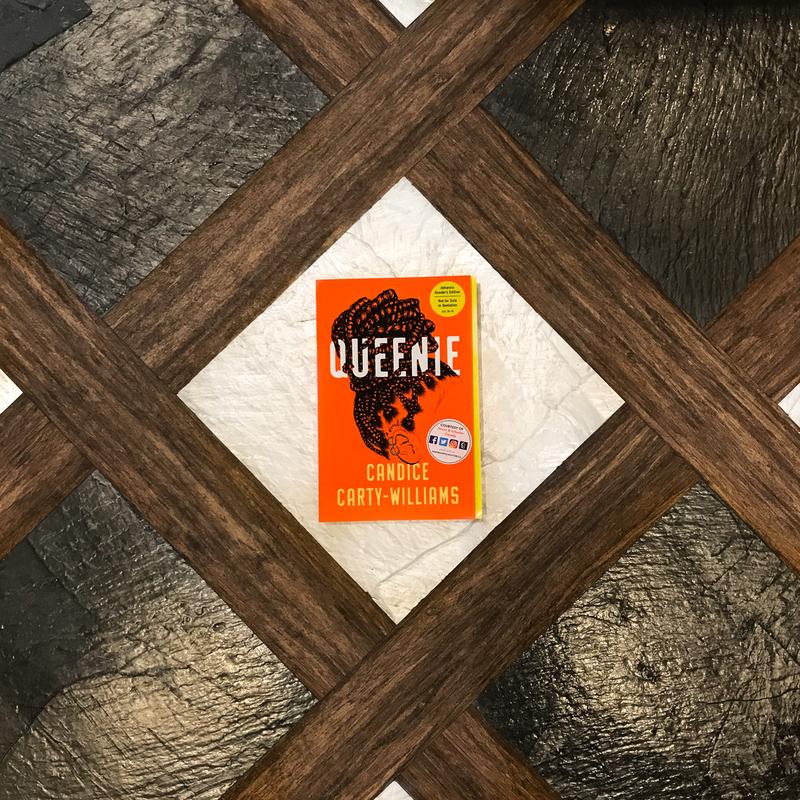 Be prepared for surges of frustration via Queenie’s decisions, but the group texts with her friends and strong family relationships balanced out those downturns, so there were ample bright parts to the dark, the brightest being Queenie herself. 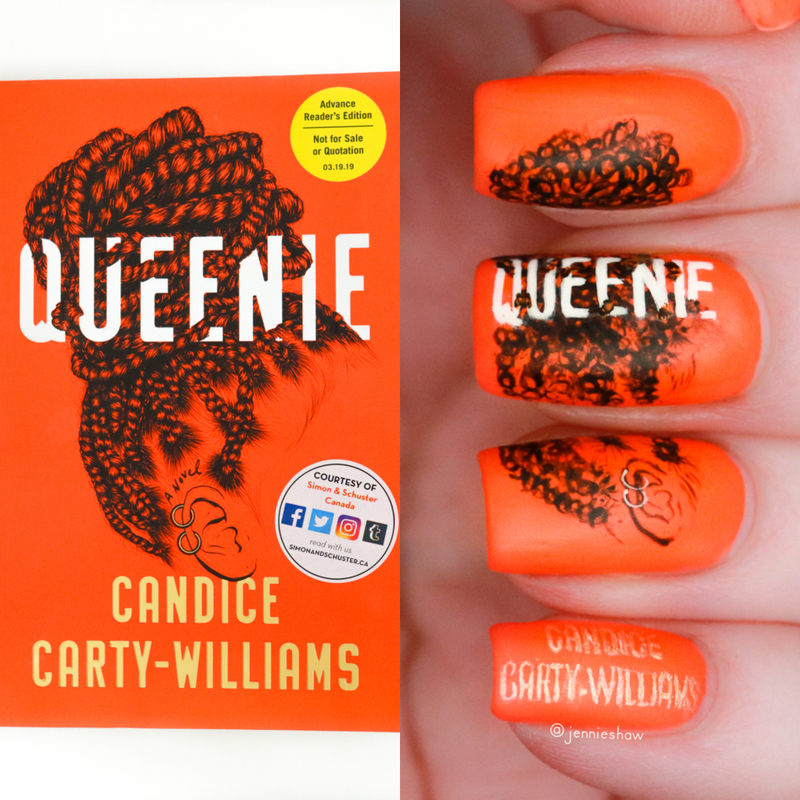 Five stars all the way, QUEENIE is out now and a must read. Big thanks to Simon & Schuster Canada for an ARC! You nailed this book cover. Hope you are doing well. Thanks so much, Amy! Hope you're doing well too! Yes! That orange! Wow, I am amazed by how well you've done her hair!! The orange is so pretty in person!! Almost a neon, but not quite. And thank you!! Thanks for putting this one on my radar! 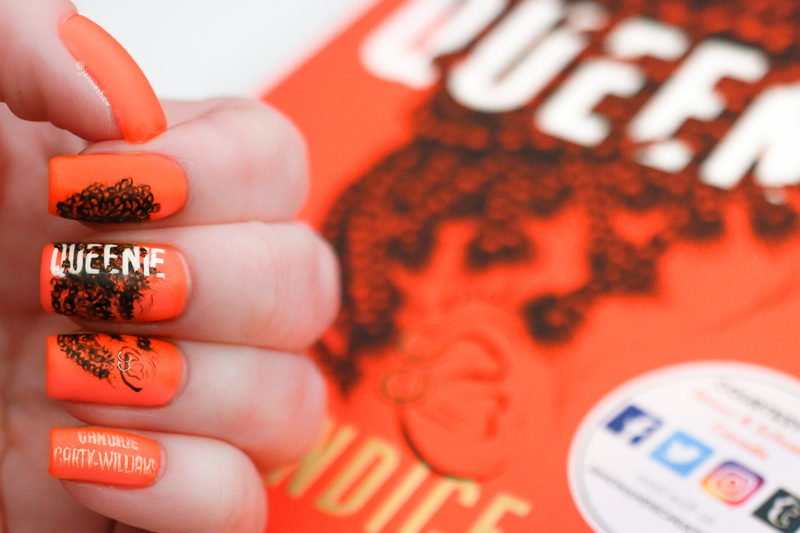 Fab job on the mani, as always- I can't imagine the level of detail required for the hair part of the cover. Thumbs up!